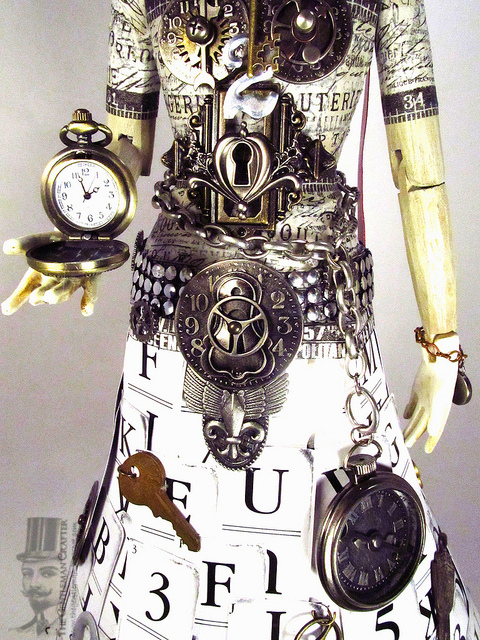 The Gentleman Crafter: Steampunk Lady Done!!!!!! 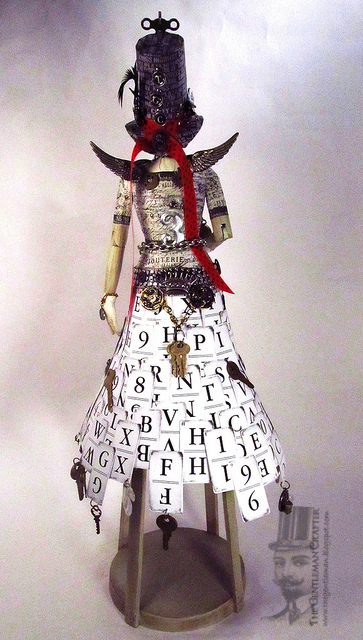 As I was saying in my last post, I have been working on this Steampunk Lady. It was a Santos that I purchased from Tuesday Morning on clearance! You may have seen it in one of my videos or blog posts...I can't recall. 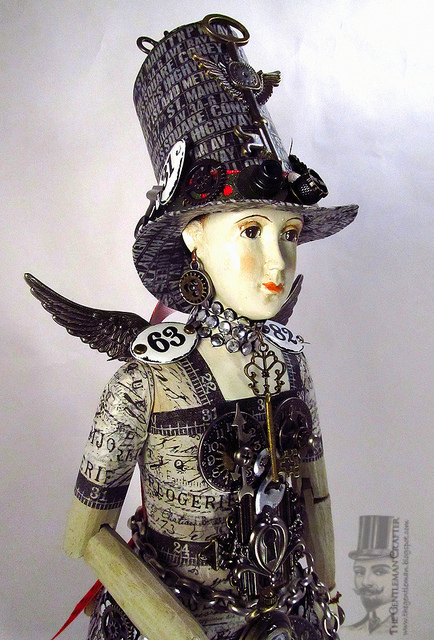 Well, it all started with a little top hat that I made, painted black and embellished. 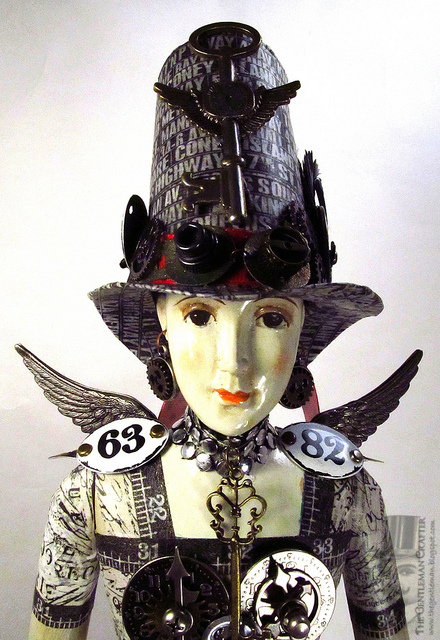 From there it went to taking off all the embellishements and adding Tim Holtz tissue tape to the hat and then covering the tissue tape with Claudine Hellmuth's Studio Multi-Medium Matte. Next, I placed the embellishments back on and looked over at the santos and thought...Wonder if that will fit her head. It did and a Steampunked Lady was born! LOL! Here she is in all her Idea-ology and vintage key glory!! Thanks Barb Engleking for the awesome vintage keys and Fiona Jennings for the lbeautiful little FOB watch she's holding! Well, off to finish up Tueday Night's Tutorial for Ustream, mow, weed-eat and plant some bedding plants before nightfall! !....Have An Amazing Day! Totally A.M.A.Z.I.N.G Jim .... LOVE LOVE LOVE! she is...FABULOUSLY over the edge...AMAZING! WOW WOW WOW this is SOOOOOOOOOO GEORGEOUS!!!!!!! Absolutely fabulous job ! what a piece of Art . OMG Jim, she is AMAZING, I love everything about her!!!!!! I hope you show her to us on Tuesday. WOW, WOW, WOW!!!! Jim she is just amazing and wonderful, teach us how to make that hat. Show her to us Tuesday, please. I knew you would figure out something to do with those things! She is absolutely PERFECT!!! I think she needs a better ame than just steampunk lady.Maybe a topic for Tuesday night. Great idea for her skirt. How did you attach it? 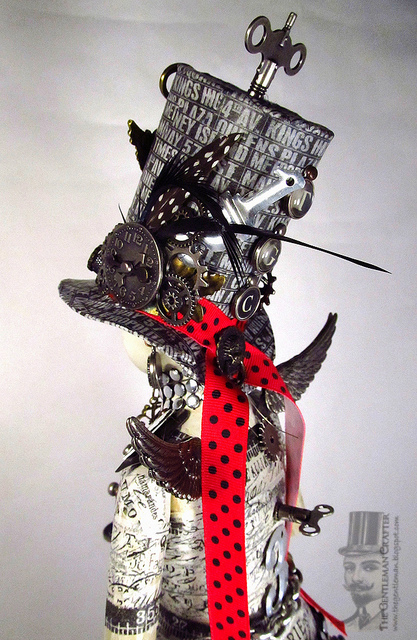 Her top hat couldn't be any cooler! I'm just itching to look at her with my fingers. Another look-see on Tuesday please. Happy Easter to you and Cesar tomorrow. OMG, JIM!!!! I LOVE HER!!!! She is absolutely beautiful!!!! You are BRILLIANT!!!! Jim, I am completely in awww of her beauty! You really are amazing and you continuously keep surprising me with your creativity! Wow, she is stunning!!! I hope you get all of your work done! Will tune in on Tuesday Night!!! She is beautiful. LUV, LUV, LIUV it! how tall is she. I can guess from some of the pieces that she is a big girl. Also...claiming ignorance here. Wjat is a Santos? What an exquisite piece of art! I love her! I said it before and I'll say it again, fan flippin' tastic. Can't even begin to tell you how exquisite this creature is! You are truly the Grand Poobah of Crafting! Wow Jim, you must be so pleased - she is just amazing!!! i have no idea how you do what you do!!!! you are amazing!!! freakin' flipin' amazing! Such awesomeness! Absolutely love her. just looking at all the things you used to define her took a long time. Lucky Fiona! thanks as always for sharing. This is so cool! You have outdone yourself, once again. I love looking at all the stuff you put on her, she must weigh a ton. She came out amazing Jim! So inspiring, thanks for sharing, Craft on! Wow! Wow! Wow! She looks totally amazing. You have a wonderful ability to add embellishment after embellishment and make it look like that was just the way it was always meant to look. Congratulations on creating a masterpiece with this one. WOWSERS...she's stunning; Happy Easter, from Canada!! She's incredible! So many awesome details... love the hat, especially! Wow Jim! So totally awesome! She is just beautiful and funky! Happy Easter! Thanks for all the inspiration and smiles you bring! WOW!!! WOW!!! can you hear mme shouting WOW!! 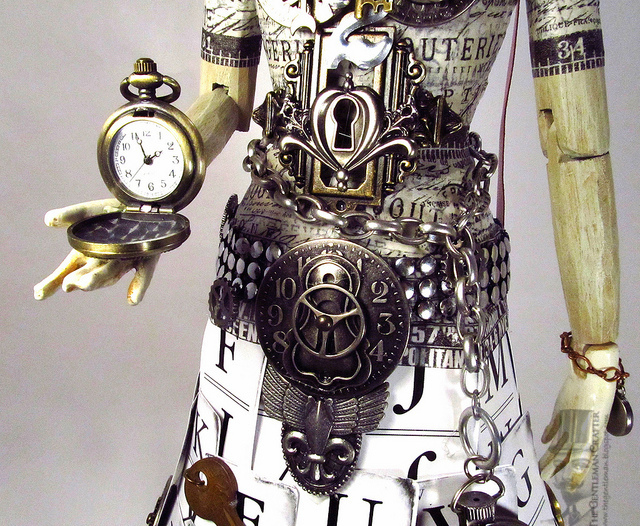 what a wonderful steampunk lady, you are a wonderful innovative crafter!! thanks for sharing !!! There are no words to describe how fab she is!! What an amazing piece!!! Are you freaking kidding me? I can't follow you anymore because you make my head explode, and I am now a dark green with envy! Beautiful thing. TOTALLY PINNED!!! How come I never find things like her when I rummage through my Tuesday Morning...what a score! And what a fabulous redo!!! The best! You ARE AMAZING!!! She is GORGEOUS! What a cool hat she is wearing--I wonder what inspired that? Love the fact that she is taped to a fair-the-well! Whatever did we do before tape came along? All I can say Jim is WOW. 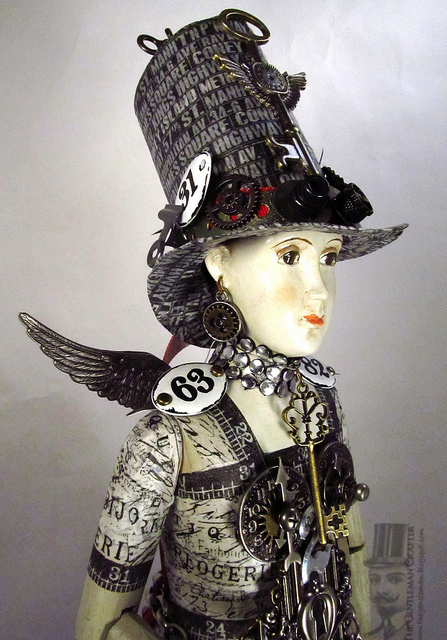 She is gorgeous all decked out in her steampunk fashion!!!! I am with Anita above, never find all these wonderful things at our Tuesday Morning stores here in San Diego, but I love to look thru their stores anyway from time to time. Been having power problems at my house recently. Our main breaker box is in need of repair. Several breakers could not be found locally and had to be ordered. We have been only turning on what we absolutely had to to prevent a fire hazard until everything could be fixed. Hopefully by this afternoon we will be running on all cylinders and I will be able to catch your ustream. I have missed so many of my favorite ustream shows already, or was only able to see bits and pieces before loosing power. Keep your fingers crossed for me. WOW she is georgous. Love it. Holy cow, Jim! This is amazing. I've spent 5 minutes just staring at her in all her glory. I don't think I've ever seen anything like this before. She belongs in an art museum. You have so many different pieces here...and I can't get over the fact that each one is absolutely essential. 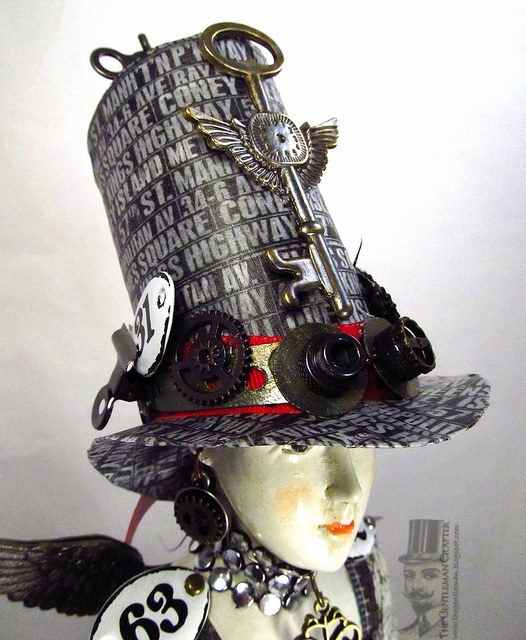 I love the turn key in her top hat! 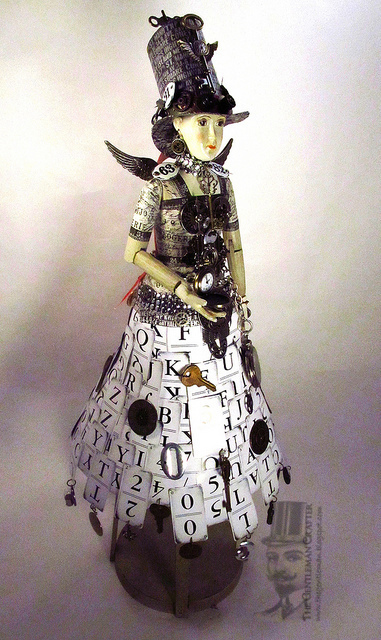 I love her winged shoulder pads and mini flashcard skirt. But the bodice...oh, my! You have officially outdone yourself. Sorry typo........... GENIUS! YOU ARE! I bet you had a great time making her!! She is just fabulous, I love her. So much to look at and marvel at, WOW! It would be so much fun to do! Also I wanted to tell you, I have had the best time going through your blog! It is also fabulous! Again so much to look at and enjoy! Thank you so much!